So we haven’t had a puzzle app yet, and the other day I came across this cute little one! Simple enough to use, this app has 3 levels – pick a level, pick a picture you would like to do a puzzle with, and off you go. 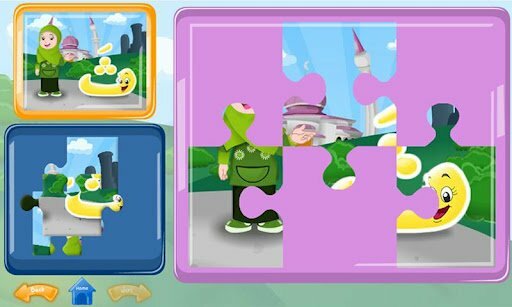 I love things like this because it gives our children an Islamic alternative – although it isn’t necessarily useful for teaching the Arabic alphabet, etc (although some of the puzzles do have letter in them), i think it’s important just for the exposure to games and pictures featuring a girl wearing the hijab, mosques in the background, and all the rest of it.